Does the Royal Family have a family WhatsApp group? 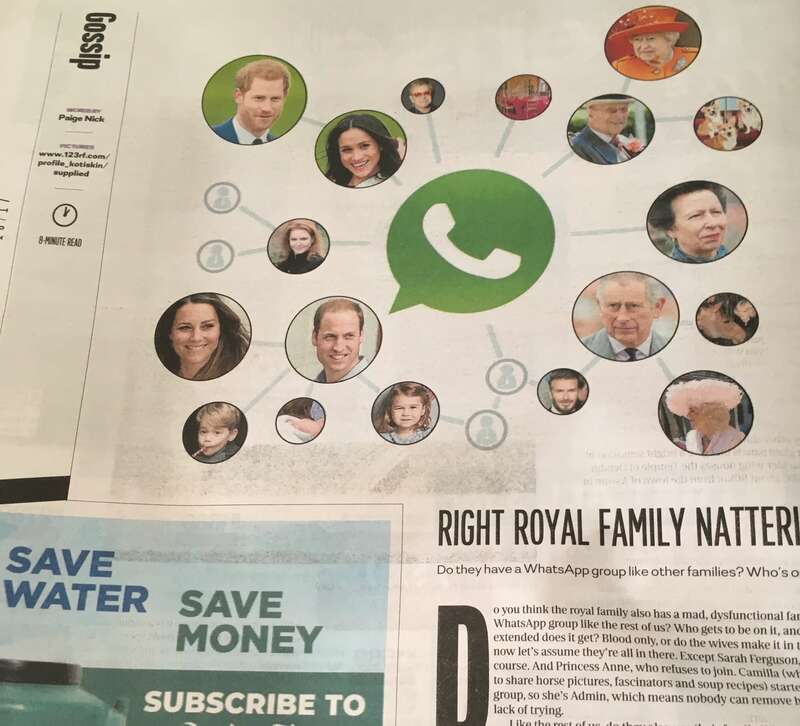 Do you think the royal family also has a mad, dysfunctional family WhatsApp Group, like the rest of us? Who gets to be on it, and how extended does it get? Blood only, or do the wives make it in too? For now, let’s assume they’re all in there. Except Sarah Ferguson, of course. And Princess Anne, who refuses to join. Camilla (who uses it to share horse pics, fascinators and soup recipes) started the group, so she’s Admin, which means nobody can remove her. Not for lack of trying. Do they also use their family WhatsApp group to make plans, say how much they love Elton John, chat about what’s going on in their lives, and wish family members happy birthday? Half to actually wish family members happy birthday, and half just as a reminder to all the slackers in the group that there’s a birthday. Does Prince Phillip ‘accidentally’ remove himself from the group regularly? Only to be joined straight back in again every time. Kate probably posts pics of the kids at bath time and shares her pregnancy scan pictures, while the queen shares pics of the corgis sitting at the dining room table in Windsor Castle. And Charles overuses emoji’s, still thinks LOL means ‘lots of love’, and makes lame dad jokes, which are followed by awkward polite silences from everyone else. Harry refuses to spell out words properly, much to the queen’s annoyance, and once added David Beckham to the group, as a joke. LOL. Has Meghan been added yet, now that it’s all official? No doubt someone pinged the newlyweds in the group, before 8am the Sunday morning after their wedding, to ask how they were getting along, with a couple of nudge-nudge, wink-wink emoji’s. If they’re anything like the rest of us, they probably have fringe WhatsApp groups too. Small break away groups that the people in the main group don’t know about, where they can skinner about each other and groan about whatever happens on the main family WhatsApp group. There’s got to be one breakaway group with just the two princes, where they roll their eyes at their dad. And one with just Kate and Meghan, where they roll their eyes at just about everyone else. Another group called ‘The Boys’, containing Charles, Will and Harry, where they discuss the footie score, trips to the country house, and what to get the queen for Mother’s Day this year. She quite liked that scarf, soap and choccies we got her last year, but we couldn’t get her another orchid, or could we? And Harry votes for Ewok costumes for the corgis, like he does every year. Yup, it’s 2018, nobody gets to dodge the good old Family WhatsApp Group, and all its dramas, sagas and etiquette fails, even those who mute the group for a week at a time, like Price William and David Beckham probably do. Wanted dead or alive. Preferably alive. Dave Henderson on Argh, Pirate, Argh!